Left, Prime Minister Voreqe Bainimarama. and Opposition leader Sitiveni Rabuka, Right. Rajendra Prasad is the author of Tears in Paradise (2004) and Enslaved in Paradise – a book recently launched in Auckland, recounting mammoth betrayals of Fijians by the British, Chiefs and Leaders of Fiji 1876-2006. The is the final part of a two-part series of Mr Prasad’s The 2018 General Election. Fiji’s 2018 election has brought two former heads of the Republic of Fiji Military Force directly against each other – one as the Prime Minister and the other as the Leader of Opposition. 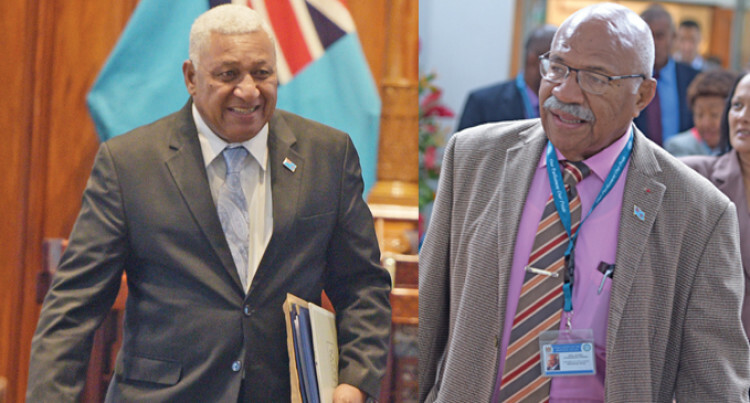 Both, Prime Minister Voreqe Bainimarama and Leader of Opposition, Sitiveni Rabuka, have the same ignominy of removing democratically elected governments – one in 1987 and the other in 2006. One claimed to restore power back in the hands of the chiefs and the other to remove and ‘clean-up’ a government riddled with corruption, cronyism and nepotism, promising to restore true democracy in Fiji. Their views on Fiji’s political direction differ markedly, with one advocating politics of ethnicity and the other politics of inclusiveness with common identity for all the peoples of Fiji. Consequently, one aims to attain his objectives by igniting racial politics and the other attempts to smother it to unite the peoples of Fiji under their common identity. Both have some common traits, acquired through military service, which gives them courage and discipline to lead. Prime Minister Voreqe Bainimarama and Leader of Opposition Sitiveni Rabuka are the Titans of Fiji politics and in their hands, they have the power to make Fiji the Singapore of the Pacific or an island of turmoil, scaring investors, impeding social and economic growth and promoting racial division and hostilities. The burden of responsibility on them is onerous but they have the ability and capacity to transform the nation, which requires not adversarial but consensual politics. Fiji had a taste of it in the later period of 1992-1999 when Rabuka/Reddy partnership delivered the 1997 Constitution to Fiji. It was the finest demonstration of ‘talanoa’ politics, where dialogue, commitment and compromise facilitated the unanimous approval of the 1997 Constitution. Their collegiality translated to racial tolerance, amity and goodwill among the people of Fiji never experienced before. Sadly, the edifice of faith and trust the two leaders built came to nought when the people deserted them, opting for the rhetoric of politicians who demeaned and denounced them for not working in the best interests of their own ethnic groups. Had Rabuka/Reddy partnership endured beyond the 1999 election and people had not abandoned them, Fiji would have evolved as a true multiracial and multicultural nation, ending the coup culture. Instead, peoples’ poor choice gave momentum to the coup culture. Subsequently, both Reddy and Rabuka emerged disillusioned and disoriented by the election results. However, fifteen years later, Rabuka made a return to politics but not the supersensitive Jai Ram Reddy. He never recovered from the rejection he suffered at the hands of his people who abandoned the NFP and opted for the grandiloquence of the FLP leader Mahendra Pal Chaudhry. The rest is now history. Indeed, Mr Rabuka has great insight into Fiji politics and indigenous Fijian politics, in particular. He knows what is best for the people of Fiji but surrounded by yelping ethno nationalists, he cannot ignore them. Their primary interest is to grab power by any means, reintroduce politics of privilege, and continue the policies and practices of the past to secure their hegemony. Mr Rabuka keenly knows the dangers inherent in pursuing such policies, which have not worked even for the people it professed to serve, though it delivered them several electoral victories. Following independence, the indigenous Fijian elite held power for 35 years out of 36 years (1970-2006) but they failed to promote social and economic prosperity in their people. Yet, Fiji’s vital resources were in their hands, which included 91 percent of all land in Fiji, customary rights and taxpayer funds, doled willy-nilly under the pretext of affirmative action. However, it only benefitted certain Provinces or targeted groups or associates of those in power. The majority of indigenous Fijians who did not benefit lived a great lie, fostered on them by their leaders, creating a belief that Indo-Fijian prosperity was the reason for indigenous Fijian poverty. Consequently, a victim mentality prevailed amongst the indigenous Fijians, viewing their situation as no different to other marginalised indigenous communities in many countries. On this falsity, the Indo-Fijians consistently suffered racial backlash, which differed in intensity from time to time. This grave injustice, perpetrated upon them for decades continued and their feuding and divisive leaders could never defend them as if accepting that backlash against their own community was both justified and deserved. As for indigenous Fijians, they wore the garment of sorrow and grief as ‘victims’, seeing Indo-Fijians as an impediment to their social, economic and political progress. Is Mr Rabuka going to re-live the great lie fostered on the nation and continue to treat Indo-Fijians as the doormat of the nation? To answer this question one must not forget that Mr Rabuka is an opportunist but has also shown shades of pragmatism, with his 1997 Constitution being the finest evidence. He had derided the Great Council of Chiefs from time to time, at the peak of his popularity in the period 1987-1992 and sought to replace Ratu Sir Kamisese Mara, a paramount chief, as the Prime Minister of Fiji, and succeeded. His clamour to restore the GCC within the first 100 days if SODELPA came to power was sheer opportunism to get chiefly support in harnessing votes. To a considerable extent it worked, as SODELPA gained six extra seats. However, election campaigns in Fiji bring the worst in politicians, as they tended to trade in deceit, distortions, lies, delivering undeliverable promises. But once out of it and the dust settles it becomes largely business as usual for the elected, feeling no contrition for engaging in massive misrepresentations to woo the voters. What the nation now needs is that the two leaders replicate the 1992-1999 era and engage in consensual politics, using the reinvented ‘talanoa’ medium, which the Prime Minister Voreqe Bainimarama introduced in COP23. The talanoa medium earned international endorsement, considered a novelty but there is no point in pontificating to the world on its values when Fiji itself fails to utilise it locally. It is time for change and both the Prime Minister Bainimarama and Leader of Opposition Sitiveni Rabuka should join hands to initiate a new era of consensual politics. If the New Year message is anything to go buy, there is a glimmer of hope that Mr Rabuka, given the opportunity, may opt for consensual and not adversarial politics. He eloquently said, “My vision for Fiji in 2019 and beyond is based on my conviction and my faith that we must build a united and progressive nation where we can live in peace and in harmony with each other. His prayer for the nation for 2019 was based on faith, which makes things possible, hope, which makes things work and love for one another, which makes things beautiful. These are encouraging words from a seasoned leader, who acutely knows what can work for a better Fiji and a better tomorrow for everyone.